Social Enterprise in Australia has a long history of community ownership and managing markets though collaborative common bond. Cooperatives and mutual societies formed to ensure their members gained and controlled their own wealth. The challenges of social enterprise in Australia today remains – to be sustainable they need to operate with a clear market focus. The creation of community wealth is a shared opportunity. Trading for social benefit can only be done with sound and ethical commercial practice. 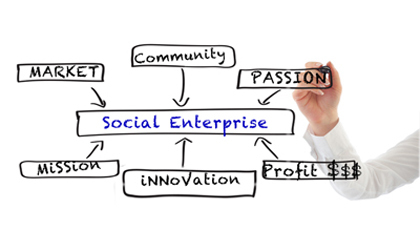 Social Enterprises are businesses. Social Enterprise Services Australia has been established assist Community, Not for Profits, Business and Government to engage with Social Enterprise promoters to build opportunity. Mainstream, Make Money, Make a difference!